Yuma is one of our new Old English Sheep Dogs coming into program in 2020! She is one of the foundation girls for our Sheepadoodle program. 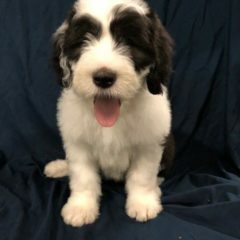 She will live her life as a pup with her guardian and after testing will hopefully produce some of our first Sheepadoodle pups in 2020! Sutter Buttes Alumni Brody debuts on Good Day Sacramento! !